The holidays are gone and so its time for a fresh look for the Blog! The last 3 weeks have been a long haul in my personal life as I worked my but off to make our house beautiful for sale. We put in a new kitchen (with slate tiles laid/ installed by yours truly), had the inside totally painted, new slate in the entry, updated the main bathroom, new lino in the ensuite, new towel bars, toilet paper holders, mirrors and a POD full of clutter. It all paid off though as this last Tues we had 9 parties with their realtors through and we accepted an offer for asking +100 on Wed night. Now to find a house to move into! Now that I can breathe again, I just spent a couple of hours (OK 5 h+ hours) updating the calls for entry page and the calendar page on the website. 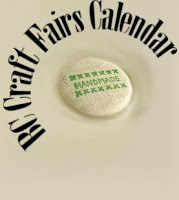 There are a ton of calls for entries and some of the winter craft fairs have jury dates fast approaching -- it never stops! So I am back to contemplating my entries and deciding which crafts I will sell this year, would love to hear what all your plans are for the upcoming craft season!